I might have a glass of beer: Why can’t Tennent’s make a success of a premium lager? Why can’t Tennent’s make a success of a premium lager? The 1980s was the decade of “premium” lager. All manner of well-known lager brands – even Harp – sprouted premium extensions, the formula of slighter higher gravity and more sophisticated packaging being an easy one to replicate. Tennent Caledonian – then part of the Bass empire – came up with Gold Bier, a lager that many still remember today. I remember that I liked it a lot, though I can’t say whether I would like it now. It had nice typography and glossy double-page adverts with stylish copywriting, in the days when lager drinkers were treated as literate. Gold Bier lasted well into the 1990s and seemed to be fairly popular, but it eventually disappeared. I have no evidence for this claim, but I have always assumed it got the chop after the Belgian group Interbrew bought Bass and Whitbread. The merged group already had heavyweight premium lagers Stella Artois and Beck’s and didn’t need Gold Bier competing with them. 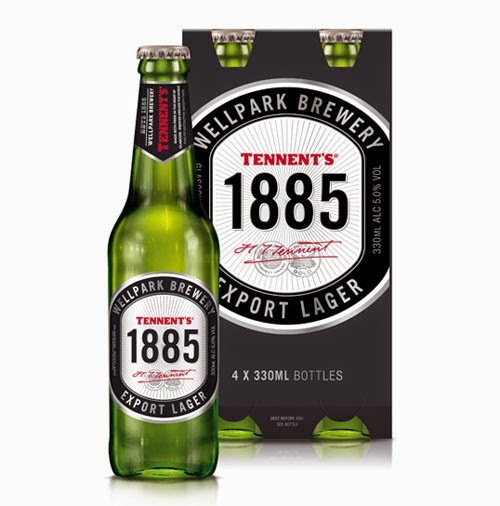 Tennents had another go in 2008 with a beer called 1885, after the putative date when Tennents, according to themselves, started brewing lager (there has been some dispute in the Scottish Brewing Archive’s journal as to whether this claim is accurate). 1885 was another pale, green-bottled 330ml effort, with a husky, grainy flavour. It didn’t last long. Apparently there was an ad campaign for it, but I don’t remember ever seeing it. 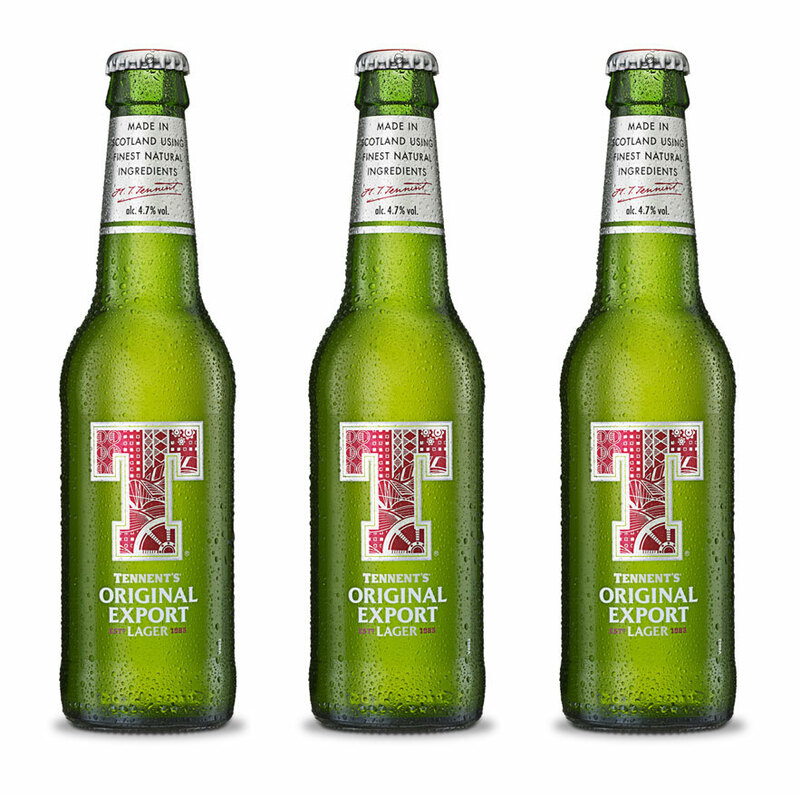 Fast-forward now to Tennent’s Original Export Lager, launched just two years ago. Original Export had very plush packaging indeed and some impressive adverts. The beer was quite drinkable too, all-malt and full-bodied; I’d have bought it regularly if there had been a few more hops. Both the beer and marketing were, in my view, head and shoulders above that of the keg ale Caledonian Best launched around the same time. And yet Best has flourished and Export flopped, which just goes to show that brewers shouldn’t take my advice about anything. 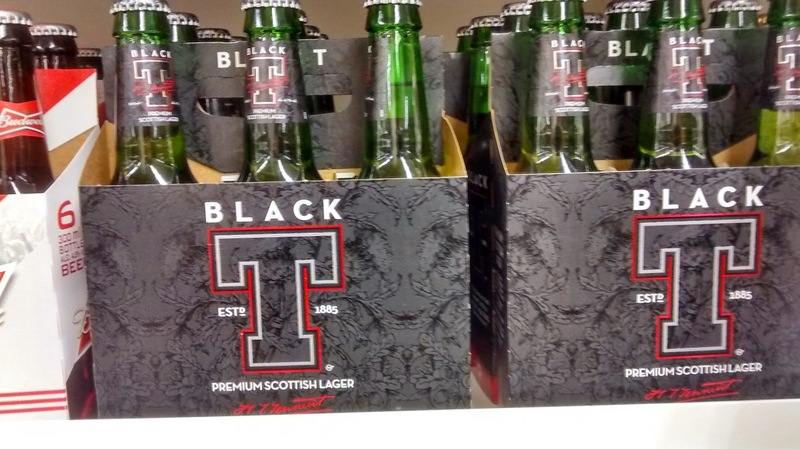 I’m looking at a six-pack of the new Black T. It’s Original Export re-branded, I am told – I haven’t tasted it yet. I suppose the idea is to link it with other allegedly premium products: Stella Black, Smirnoff black label, Johnnie Walker black label. Whether it will be any more successful than its predecessors remains to be seen. Why have Tennent’s efforts to get into the premium sector failed so regularly? Well, that has, I think, something to do with who drinks (or doesn’t drink) Tennent’s and how they regard it. I tend to divide them into four groups. 1. TL fans. These folks love Tennent’s Lager and consider it the best lager available. They like the standard lager, so have no real motivation to buy the premium version (You see expat examples of these on the Tennent’s Facebook page, begging to know where they can get a frosty can of TL in Australia or America). 2. Tennents-haters. Do not believe anything remotely drinkable can ever come out of Wellpark. It should be fairly obvious why a new beer is not going to sell well among this group. The Tennents brand is quite peculiar in being loved by the first group, but toxic among the second. There is a third group which I think is a bit unusual. 3. Contemptuous consumers. There is in Scotland a discernible group of consumers who think Tennent’s is rubbish. But they drink it anyway. Why exactly this contempt exists, I’m not sure. Perhaps the local, ubiquitous beer will always be scorned, irrespective of its actual quality. I think Tennent’s is no worse than most standard UK lagers and better than some. It’ll never be my favourite beer but it doesn’t deserve the abuse it gets from some quarters. Which brings me onto my fourth group, which consists of me and three or four other people. 4. Agnostics. I am not joking about the small size of this group. Every Scottish drinker, it seems, has an opinion on Tennents; it’s almost as divisive as Marmite. I have only ever met one other person who was willing to judge a Tennent’s beer on its merits (I’m vain enough to imagine that I try to be objective). Over and above that, though, we have to consider other factors: the commoditisation of premium lager itself, and whether there is actually room for another brand. But that’s for another time. I think the last time I had a Tennent's was back in secondary school, maybe 16/17 at the time, and I really don't remember much about it. Next time I am home I'll have to try some again and make a proper opinion, it can't be any worse than Gambrinus now can it? To me Tennents has a particularly unpleasant taste compared to the other mainstream lagers. The problem is trying to range-extend upwards. Tennents is known for being a cheap, session-strength lager, so slapping a big red (or black) T on a bottle and trying to sell it at a higher price will never sit well with T fans or haters. The discerning tramp would go for Spesh before Super T. Super T is for the lower class of tramps. Is it possible they see their market in a similar way to you, and they're trying to produce something that will convert some of group 3 to group 1? Whether that would be a good use of their time and money is another question. I think they had Export and Extra at 5% before Gold as well, similar can to Super. Ed: that'll be hops, they are quite bitter, you're probably not used to it. Phil: not sure that group 3 care all that much what they drink, as long as it's familiar. If they had the same analysis as me I don't think they would bother launching it. Ian: before my time I'm afraid, but wasn't Tennent's Export a darkish heavy ale back then? Could have been, I only vaguely remember it existing. Tennent's Extra was a fairly successful premium 5% lager in the 80s and early 90s, both on draught and in cans. I well remember Extra in the black can. Decent lager and at sensible price too. Tennents gold beer was amazing,can still remember it's great smell,get your finger out tennents and bring it back. “To clear up the 1885 date, the Scottish Brewing Archive article was written by a CAMRA person who was doing work for S&N at the time. He is a totally discredited person as his jealous smear about the 1885 date is pure balderdash (and he didn’t have evidence for any other date either). He knew very well that Dr Roy Summers, the Brewery Director of Tennent’s Wellpark Brewery, published in the early 1980s the extracts from the Wellpark Brewery brewing records of 1885 which conclusively showed that the first Tennent’s Lager production for public sale was in May 1885. I saw these records with my own eyes. The chronology of the 1885 date also ties in with young Hugh Tennent who visited Bavaria in 1881/2 on the Grand Tour and checked out German Lager. He “Came of Age” on Oct 31, 1884 and had a huge party of all the directors, workers and press in the City Halls of Glasgow, becoming sole owner of the brewery company. He then purchased in 1885 the 2 continental lager yeasts used in Tennent’s Lager (one Dortmund and one Danish) and finally started the various trial brews that lead up to the production in May 1885 for public sale. As Rabbie Burns said ‘facts are chiels that winna ding’. QED." Thanks Planetblog, fascinating comment there. Mr Meldrum will probably remember that relations between Tennent’s and CAMRA in the 1980s were, to put it mildly, not the best. Both the house paper Tennent’s Times and the Glasgow Guzzler of the period reflect this. No 3 exists because you go to a pub or club in Glasgow later at night and everything else is £3.50 a pint or more but the special offer is tennents. It's usually the cheapest draft by far. It's cold and wet so who cares by then. Haters (no 2) and also no 4 drink it too each having there respective opinions. But at the end of day everyone had the same reasons for ending up drinking it. What pint was cheapest, oh tennents?, fine that'll do. I too really liked Gold Bier, and would probably buy it again were it available. I also remember Tennents Dry, which they launched early -mid nineties. It came in a green 330ml bottle, and I remember it being quite nice. But again no one seemed to buy it, and it only lasted a few years. I drank basic Tennents, draught and cans, in my late teens-early 20s. There wasn't much choice in my home town in the 1980s, but I liked Tennents and still would have a draught pint of it where available. It's refreshing and has decent flavour and body for a 4% lager. I found Tennents Extra a very good lager, with an extra kick at 5%. It seemed popular but inexplicably disappeared. Tennents Super was brought out to compete with Special Brew for the alcoholics markets. I never tried that.